One sponge at a time, we're trying to contribute to a more sustainable planet. Dyes and glues in traditional cellulose sponges can be harmful to our environment and polyester scrubbers never disappear from landfills. We wanted to provide consumers with a better option. Twist Clean uses 100% plant based materials in the manufacturing of our residential cleaning tools. We get the wood pulp for our cellulose from FSC Certified sources and all of our scrubbers are hand sewn onto their cellulose bases. Thank you, Thank you, Thank you. 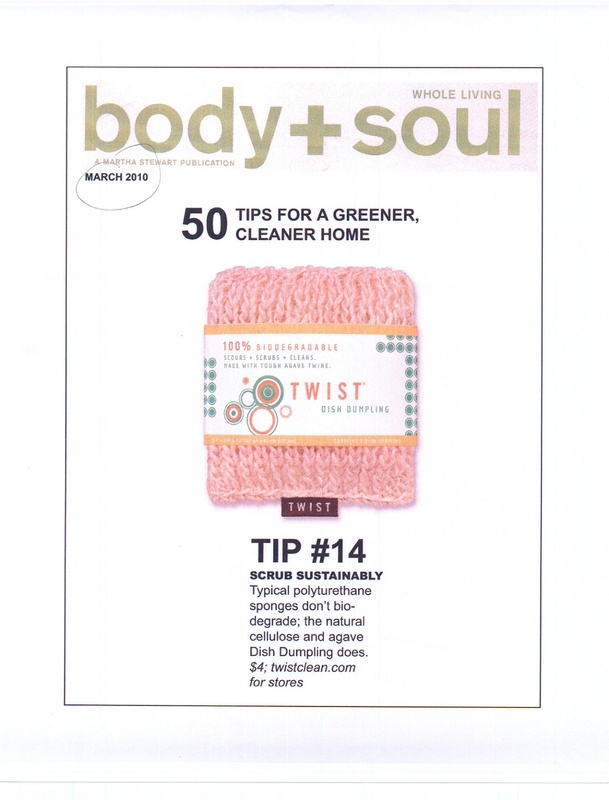 The worlds first scrub sponge that comes in a clean, neutral color (not hot pink or bright yellow). The worlds first sponge that doesn't fall apart after one week. 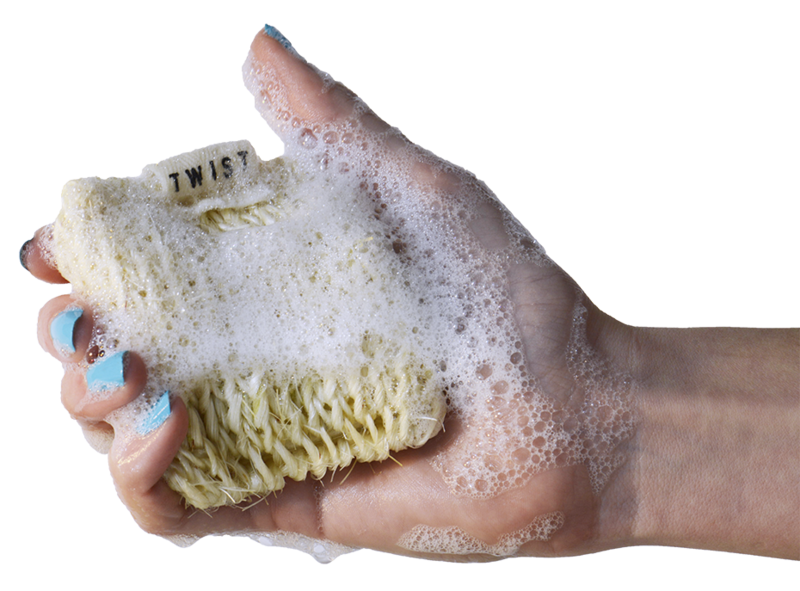 The worlds first sponge that actually cleans and does not scratch surfaces. I love that it's plant based. I've waited thirty years for a great scrub sponge. Don't ever discontinue this product!!! 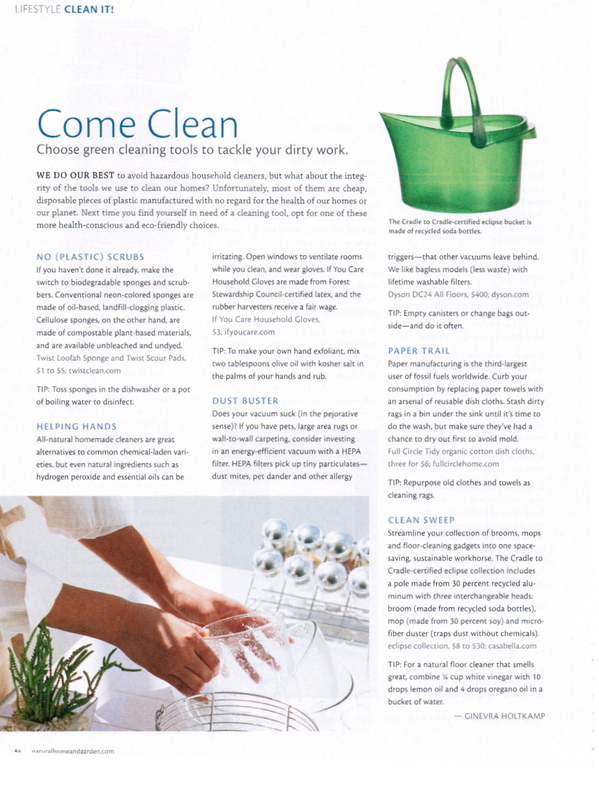 Natural Home & Garden Magazine, July 2011, "Come Clean"
Lonny Magazine, April/May 2010 "Clean & Green"
Organic Spa, 9/1/09, "Green Design Solutions"
GRID Magazine, 9/1/09, "Chemical Free Cleaning"
House Beautiful, 8/1/09, "The Best!" Forays of a Finance Foodie, 7/28/09, "TWIST Ravioli Scrubby"
Self, 7/1/09, "Think Green: Cookin' Good"
Houston Chronicle, 6/3/09, "Cool Kitchen Contraptions"
The Greenest Dollar, 4/13/09, "TWIST Review"
Long Beach Magazine, 3/1/09, "Handy Helpers"
Bon Appetit, 2/1/09, "Clean Green"
Natural Food Network, 1/19/09, "New Cleaning Tools"
Time Out NY 1/7/09, "Green up your act"
CasaSugar.com, 12/24/08, "Twist Euro Sponge"
Florida Style 9/1/08, "Kitchen Craze"
Country Living 8/1/08, "Tips and Tools"
Live Better, 8/1/08, "Five Products You Should Check Out"
Everyday with Rachel Ray, 8/1/08, "Everyday Faves Home"
Elephant, 6/1/08, "Green Up Your Act"
CBS Personality Steve O'Brien's Blog, 6/1/08, "Green Kitchen"
MomToBeDepot.com, 5/28/08, "Oprah Says to Throw Away Your Sponges..."
House Beautiful, 5/1/08, "Kitchen Trends"
Celebrity Baby Blog, 4/24/08, "Natural cleaning supplies for a healthier home"
Superforest.com, 4/22/08, "Clean your dishes with these sponges!" Star-Ledger, 4/19/08, "These will grow on you"
Fayetteville Observer, 4/19/08, "It's Time to Go Green"
Rocky Mountain News, 4/16/08, "Create an Eco-friendly Kitchen"
Green Upgrader, 4/15/08, "A Fun Twist with TWIST Eco-friendly Sponges"
Central Jersey House & Home, 4/1/08, "Twist & Shout"
Canadian Home & Country, 4/1/08, "Clean & Green"
Today's Health & Wellness, 4/1/08, "Make Spring Cleaning Green Cleaning"
Fancy Foods & Culinary Products, 3/1/08, "Cleansers Come Clean"
Gourmet Retailer, 3/1/08, "Editor's Choice"
Food Maven, 2/28/08, "TWIST Sponges"
Mindful Mama, 2/1/08, "The Green Nest"
The G Living Network, 1/21/08, "TWIST Sponges"
Charlotte Observer, 1/12/08, "Cleaning Gear with European Style"
Boston Home, 1/1/08, "Sustainably Yours"
Delicious Living, 1/1/08, "Monthly Indulgence"
Baltimore Magazine, 12/1/07, "Trend Watch"
Daily Camera, 11/26/07, "Sponge talk with Brian Ross"
Daily Camera, 11/22/07, "Operation Black Friday"
PrairieMod, 11/3/07, "A New Twist on Cleaning the Kitchen"
Family Circle, 10/17/07, "Eco-Tip: It's Easy Being Green"
The Seattle Times, 10/6/07, "4 Things We Dig"
Detroit Home, 10/1/07, "Getting the goods"
Indianapolis Monthly Shops, 10/1/07, "Backyard In A Box"
Colorado Homes & Lifestyles, 10/1/07, "Wiped Clean"
Ideal Bite, 9/28/07, "Can a bundle of rags save you a bundle?" Boulder County Business Report, 9/27/07, "Firm offers eco-friendly..."
EnviroPages.org, 9/21/07, "Eco-Friendly Sponges from TWIST"
Better Homes & Gardens online, 9/17/07, "Top Green Cleaning Supplies"
Natural Home Magazine, 9/1/07, "Green Cleaning"
Rocky Mountain News, 8/17/07, "Ventures: TWIST"
Apartment Therapy, 8/9/07, "Best Products"
5280 Magazine, 8/1/07, "Object of Desire"
ColoradoBiz Magazine, 8/1/07, "Colorado Cool Stuff"
The Oregonian, 7/31/07, "Market Basket"
AngiesOrganicReviews.com, 7/24/07, "A New TWIST on the Sponge"
Channel 9 News (Denver), 7/25/07, "TWIST Sponges"
IHeartLuxe.com, 7/9/07, "TWIST- Eco-friendly sponge products"
LeafyGreen.info, 7/5/07, "TWIST Euro Coth Review"
Natural Products Marketplace, 7/1/07, "Our product picks"
Natural Products Marketplace, 7/1/07, "The Green Movement Comes Home"
The Cincinnati Enquirer, 6/23/07, "Gone Green: Eco Sponges"
The Natural Foods Merchandiser, 6/1/07, "New Product Review: TWIST"
Kitchenware News & Housewares Review, 6/1/07, "TWIST Offers Eco-Friendly Sponges"
Sprig.com, 5/31/07, "Be Cruel to Dirt, Kind to the Planet"
Treehugger.com, 5/27/07, "TWIST Sponges in Clever Packaging"
Arizona Daily Star, 5/27/07, "Clean up your scrubbing act"
NotCot.com, 5/26/07, "TWIST Loofah Sponge"
St. Petersburg Times, 4/21/07, "Home front: Recycling TWIST"
Boulder Daily Camera, 4/18/07, "Cool Tool"
The Indianapolis Star, 4/14/07, "What's New: TWIST and Shout"
The Denver Post, 4/5/07, "Dirt Patrol"
Boulder Daily Camera, 3/26/07, "Putting a new TWIST on cleaning"
Yesterday while mulling over the sponges at the grocery store I noticed there was a new sponge AND it was on sale. I bought it, used it today and I have to tell you just how much I love your scour sponge! I love it sooo much I'm telling every one about it! It's soft, spongy and despite that it's white, surprisingly rinses clean every time. Bonus...it's all natural! Your sponges are the only ones I will purchase from now on. My mother always told me, "When you have something nice to say, say it!" Well, your sponges are seriously the jam. I can't believe how long they last, I love how eco-friendly they are, and the fact that you can throw them in the dishwasher is just the icing on the vegan cake. I can't believe how much awesomeness you get for such a low price. I never knew I would love a sponge so much! Thank you! We just purchased your sponge/loofa combo a few weeks ago for the very first time. You have a customer for LIFE as it is just AWESOME! Just wanted you to know that we are super impressed and amazed that one little item can make such an impact! CHEERS!